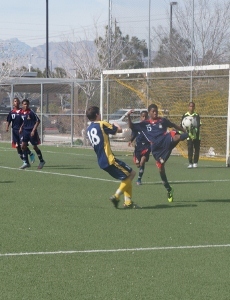 (PFL): The PFL Youth Football Programme’s Under 13 team recently returned to the Island following their participation in the 2013 Las Vegas Mayor’s Cup International Showcase in Las Vegas, Nevada, which took place 16-19 February. Although returning from the tournament with a less than glamourous record – one win and three losses-the valuable experience gained will contribute greatly to the players’ development as they begin to fulfil the short and long-term goals organisers and coaches of the Programme have set for these talented youngsters. With an average age of only 12, the team participated in the Under 14 division playing teams from Utah, Nevada and Canada.